As part of a charity fundraising event several years ago, makers, jewellers, ceramicists, painters, knitters and sculptors were all asked to design a Christmas decoration to auction. A bit stumped at first, I finally produced trees, hearts and stars made from my canvas to hang on the tree. The hearts have since become a regular feature of my collection. 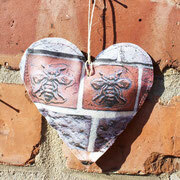 They are popular to hang up around the house, as present toppers or quite simply a small token of LOVE! 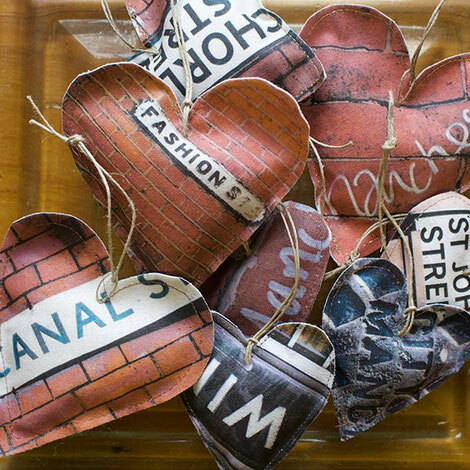 I have popped some hearts in my cards for those special people in our lives. 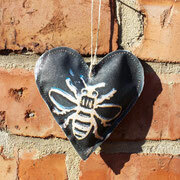 Each heart is printed and lovingly made by hand, using hemp thread to hang. Only 1 side is guaranteed printed.